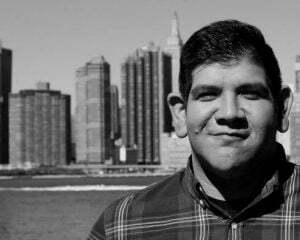 "Smash clone" is an ugly generalization. It's usually given to titles in a subgenre which, honestly, should be a lot more prominent than it is. Despite many tries, non-Nintendo developers have yet to nail the platform fighter. What most of these developers fail to realize is beneath Super Smash Bros.' mascot appeal lies a base appealing to both casual party goers and more dedicated players. Rivals of Aether is going to mean more to the latter. 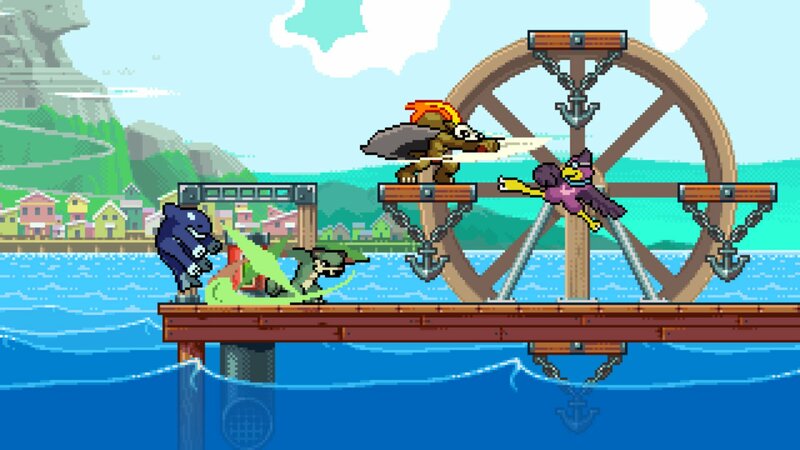 Welcoming comparisons to the aforementioned Super Smash Bros. (even going so far as to challenge it in some areas), Rivals of Aether is a platform fighter stripping away most of Smash Bros' zanier elements while focusing on a stronger, speedier, brutal core. The land of Aether is separated into warring elemental factions: Water, Fire, Earth, and Air. When a shadowy force threatens the word, the titular rivals jump into action. Choosing one of the six characters -- with two unlocking later -- throws you into Rivals of Aether's frenetic gameplay in no time. Character design is fun, and I'm a particular fan of playing as a whale with arms and legs, but each of their play styles will be immediately recognizable to anyone who's played a fighting game before. There's the slow but hard hitting character, the tricky character with delayed actions, characters who set up traps, and fast but less strong types. But what makes Rivals stand above other standard fighting game archetypes, however, are the elemental tricks. As mentioned, each character has an element that factors into their move set and tends to have an effect on the stage as well. For example, Zetterburn (the fire lion) has a down special fire punch which not only can strike the opponent but leaves lingering fire on the ground causing burn damage for a few seconds. These also include passive abilities like Wrastor's air current side special which helps him traverse faster or Forsburn's obscuring smoke. Before I knew it, Rivals had eased me into even more competitive play than I had been accustomed in this genre thanks to not only factoring in how much damage each hit will do (and subsequently how far the opponent will fly) but where to initiate the attack. Although the objective is to damage your opponent until they eventually go flying off the stage, a la Super Smash Bros, there's an impressive meta game in the area around each character. Do I lay a one of Orcane's puddle bubble traps on the edge of the stage or do I try and do as much damage as possible and factor that trap into a combo? Playing into this deeper metagame are the parries. Eschewing a traditional block, each character has a two-frame delayed parry which, when successful, will briefly stun the opponent and opens them to a counterattack. Parrying is deeply satisfying as each one is accompanied by a "ding" and a glowing circle. It's appropriate since every hit feels just as weighted and important. 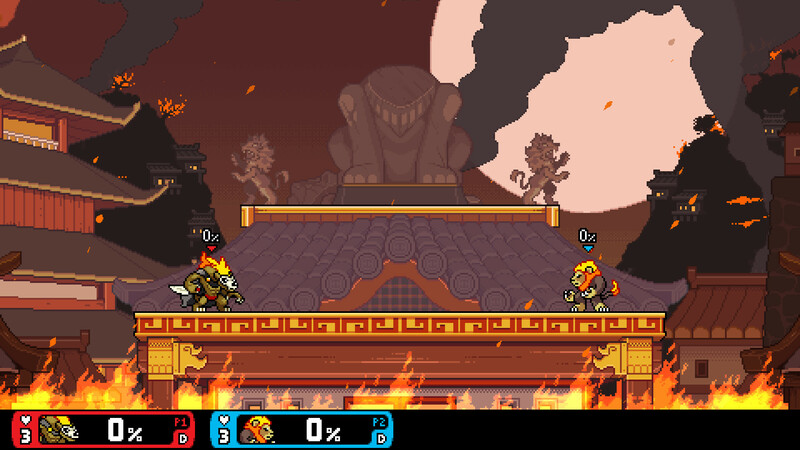 For the first few hours, I played Rivals of Aether traditionally. Used dodge rolls, parried a few attacks, and relied mostly on my specials and strong attacks (read as: smashes), but the longer I dived in the more its advanced techniques started to reveal themselves. And this is where Rivals truly distances itself from its inspiration. Tutorials go in-depth on more inside baseball terms like "frames" and "hitboxes" (which you can turn on in the training mode), and suggested strategies for each character. Advancing through those open up optional tutorials teaching short hops, wall jumps (there's no ledge grabbing here, instead you have to short hop off the wall to maybe save yourself), and even how to alter the trajectory of the angle you go flying. Whether or not I actually played like one is up for debate, but I felt like a pro. That's something that's never happened to me before. I just wish I was able to take my skills online. Rivals offers ranked and player matches, but I only played a few rounds with a handful of people. Unfortunately, the community isn't full enough just yet to really test out the netcode. While the gameplay is frenetic and fun, Rivals of Aether may not appeal to everyone, however. The frenetic and fast pace can eventually skew into frantic territory as the speed of combat takes some time to get used to (a gamepad is absolutely necessary). And I may really enjoy the arcade feel to its story mode (and more importantly, its endless battle filled Abyss Mode), but some may find its presentation lacking. But there's a ton of personality that comes through its gameplay and how well its weaved into its characters. The 16-bit art style helps each character flourish; especially through elemental attacks. The best example of this is the ice bear, Etalus, who not only turns their fist into ice axes and hammers, but can absorb that ice and give themself giant ice jaws and it's pretty damn cool. Thanks to its tight focus, each character plays and animates as uniquely as this giving Rivals a much grander scale than its humble presentation would imply. Just as its deeper mechanics make itself known the more time is invested, the art flourishes grab your attention more the longer you play. 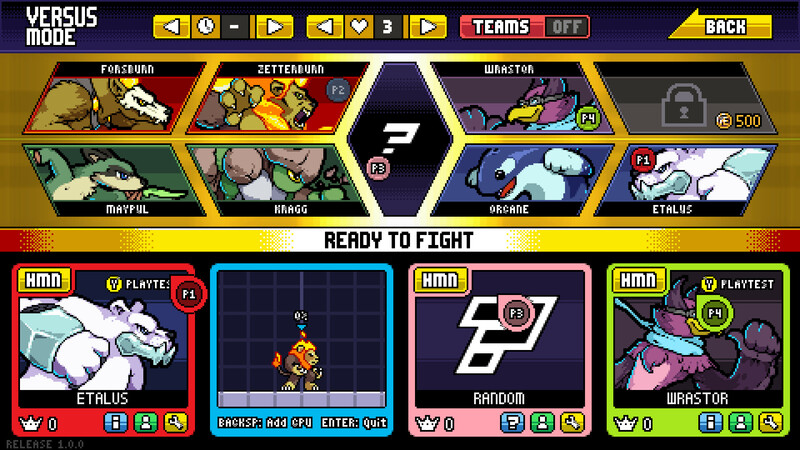 Thanks to a base inspired by Super Smash Bros., Rivals of Aether is able to dedicate itself to evolving the already familiar mechanics. Rather than break the game into wavedashing or applying directional influence by accident, creating a game with those advances in mind allows Rivals to become a more fully-fleshed out fighter. Instead of dancing around the "is it a fighting game or not?" question plaguing Nintendo's major mascot title for years, Rivals of Aether goes full throttle into the genre and delivers an experience the platform fighting genre deserves.